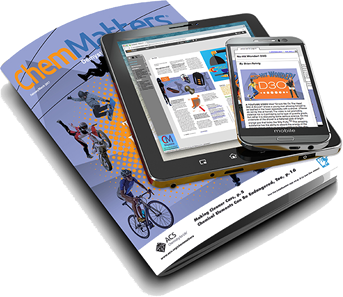 Your AACT membership includes a one-year, individual subscription to ChemMatters, the award-winning magazine that helps students make connections between chemistry and the world around them. Each issue includes articles you can integrate into your daily instruction and an accompanying online Teacher’s Guide, which contains follow-up hands-on activities, classroom demonstrations, article background information, and other resources. Find supporting materials in the AACT resource library to help you implement ChemMatters in your classroom. LESSON PLAN | Chocolate: The New Health Food? Current subscription holders joining AACT may choose to continue a parallel subscription with ChemMatters, cancel their subscription, or apply prepaid subscription funds towards their AACT membership during registration. Please note that AACT does not offer bulk subscriptions. To apply prepaid funds during AACT membership registration, you must register via phone by contacting Member Services at (800) 333-9511. To cancel your current ChemMatters subscription, please contact Member Services at (800) 333-9511, or email service@acs.org. *Print edition available to Teacher and Affiliate members in US and Canada only. Find selected articles and content from past issues online.